A little over a year ago I posted about the beginnings of a project regarding a vanity set. I've finally come back to it in a satisfactory way, though I'm still a ways from completing it. Here are some of the drawings I've worked on recently. In fairy tales, unlike the more narratively familiar and internally consistent fantasy magic, there are no rules; this is the point of magic, and possibly the capriciousness of fairies. In fairy tale magic, things simply happen. 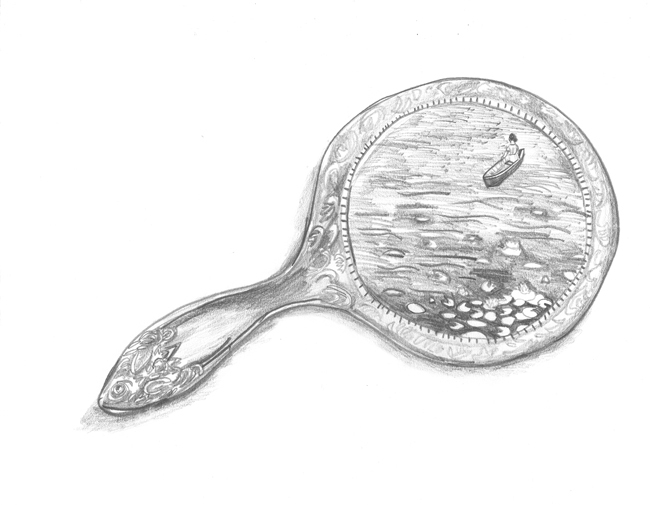 ... A mirror turns into an ocean not because it is an enchanted mirror or the woman throwing it is a witch or there are fairies around, but because placing an ocean behind them is how the characters must escape their pursuers. Events occur because they are visually, thematically, and narratively satisfying, not because they make any sense or are explained by a consistent system of magic or because they follow logically from what is previously known. ... In drawing a world of fairy tale magic, animals are characters, the tongues of dragons must be collected, drawings cast magic spells, animals and people are friends, dresses fit in walnut shells, and visual and poetic logic overrides formal logic. This project is about that kind of visual and poetic logic. Specifically, the logic of escape, what Propp identifies as "the rescue of the hero from pursuit" in his study of fairy tale narrative. One example is: "The hero flees, placing obstacles in the path of his pursuer. He throws a brush, a comb, a towel. They turn into mountains, forests, lakes." Alternatively, "The hero hides himself during his flight. A river, an apple tree, and a stove hide a maiden." I was struck by this beautiful narrative pattern as well (though perhaps not as prescriptively as Propp). For myself, I was particularly interested in the tendency of these objects to be thrown down by the female protagonist (or princess) and therefore be traditionally feminine items. Again, the woman need not be a witch herself to work this magic - another appealing aspect. 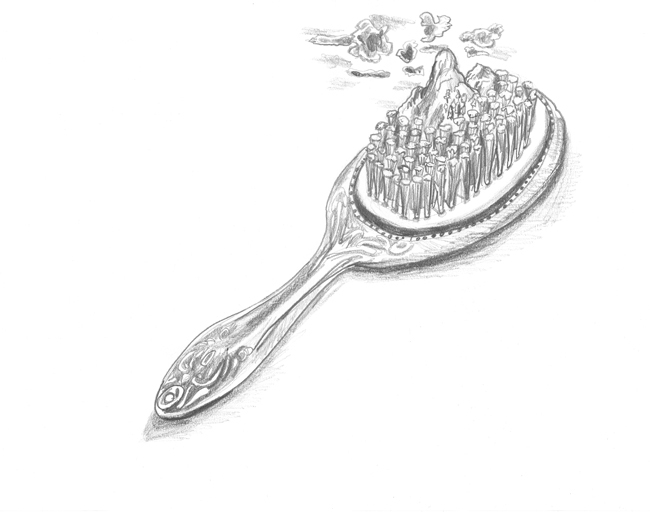 The children saw her from afar, and the girl threw a brush behind her which formed an immense hill of bristles, with thousands and thousands of spikes, over which the nix was forced to scramble with great difficulty; at last, however, she got over. 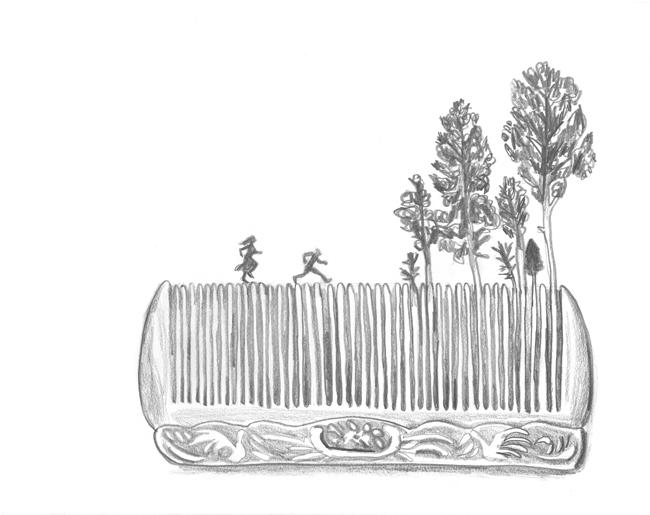 When the children saw this, the boy threw behind him a comb which made a great hill of combs with a thousand times a thousand teeth, but the nix managed to keep herself steady on them, and at last crossed over that. Then the girl threw behind her a looking-glass which formed a hill of mirrors, and was so slippery that it was impossible for the nix to cross it. The Baba Yaga, bony of limb, quickly jumped into her mortar, sent it flying along with the pestle, sweeping away the while all traces of its flight with a broom, and set off in pursuit of the girl. Then the girl put her ear to the ground, and when she heard that the Baba Yaga was chasing her, and was now close at hand, she flung down the towel. And it became a wide, such a wide river! Up came the Baba Yaga to the river, and gnashed her teeth with spite; then she went home for her oxen, and drove them to the river. The oxen drank up every drop of the river, and then the Baba Yaga began the pursuit anew. But the girl put her ear to the ground again, and when she heard that the Baba Yaga was near, she flung down the comb, and instantly a forest sprang up, such an awfully thick one! The Baba Yaga began gnawing away at it, but however hard she worked, she couldn't gnaw her way through it, so she had to go back again. Not all of these are pulled from folk and fairy tales, of course. Many are my own creation, inspired by these ideas. I will post more drawings and perhaps more fairy tale excerpts soon!